If the CRIS document is present it will also show the year on there. The same number will be stamped into the chassis of the caravan. If the numbers have been scraped of the windows steer clear as this has almost certainly been stolen at some point. Ask for proof of ownership and identification (If they registered it with Cris then there name and address will be on the document). Check for soft wall boards, dark stains on walls/ ceiling.. If it has any of these it almost certainly has damp, if you have a damp meter take it with you and check it over. Another indication of damp is a musty damp smell. If the floor has a spongey/springy feel it almost certainly has delamination of the floor, this basically means that the polystyrene between the under board and the floor board has broken up. This can be repaired by injecting expanding foam but obviously does reduce the value of the caravan prior to repair. Ask to see everything working, if the seller refuses then they normally have something to hide. Check the tyres, just because the tread looks good it doesn't necessarily mean the tyres are. Caravans spend a lot of the time standing still and the side walls can perish.. Look out for this.. Check around the caravan body for corrosion, if the aluminium is corroded it means that there is water ingress, I.e damp inside. check all windows for cracks/splits, caravan windows are not cheap to replace. Check the door lock and hinges and security of all external lockers. Check the gas and electrics, a faulty gas system can be lethal, if in doubt have it checked by a professional. 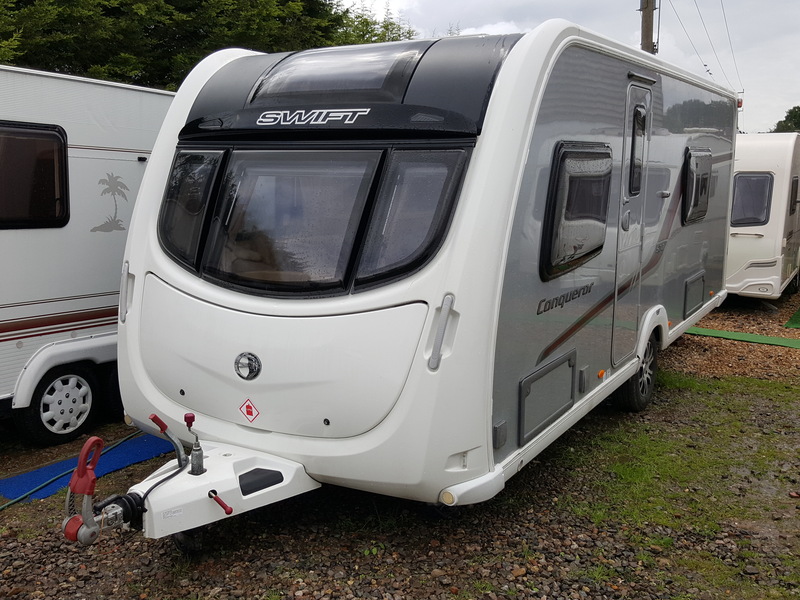 Check the weight of the caravan fully laden to ensure your vehicle is capable of legally towing it. Your vehicle owners manual will tell you your maximum towing allowance. Check all the light lenses are intact, they can be quite expensive to replace. Don't be afraid to ask questions, don't be rushed, if your unsure then walk away. If you know someone who knows what there looking for take them with you. If buying privately carry out a CRIS check, this is the same as an HPI check on a car and will tell you if the caravan has any outstanding finance, recorded stolen, recorded written of cat c/d etc. You can carry out a CRIS check online at www.cris.co.uk or call them on 0203 282 1000 the cost is just £14.99 ... Money well spent. If we can be of any assistance please do not hesitate to contact us.. We offer a inspection service at just £85.00 subject to location. Caravan Sales Fair Oak Southampton Hampshire. Quality Caravans at Sensible Prices.